This is Templepatrick’s second success of the season following on from their T20 Shield victory last month. 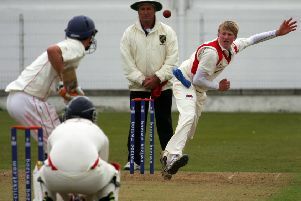 Fifty-seven from Stewart – along with his in the second innings – helped the Ballyclare side to their first triumph in the competition’s 127-year history. He stayed for 48 balls and hit four boundaries during his stay at the crease. Earlier in the innings, Ricky Greer (29) and Artie Campbell (16) set a solid foundation as they put on 48 for the first wicket. Forty-eight for one soon became 52 for two as James Jackson found David Menaul off the bowling of Jonathan Terrett. There were also contributions from Daniel McFadden (39) and Ross Bryans (25). Templepatrick lost two wickets with the score on 160 to put Waqas Muhammad on a hat-trick. Mark Thompson was the last wicket to fall as Brian Anderson had him caught by Neil Cahill. Callum Weir was able to hang around and support Stewart as Templepatrick set Cliftonville Academy a target of 226 to win. For a long time, Templepatrick were looking unlikely to pass the 200 mark, but as the Cliftonville Academy bowlers began to tire, the batsmen capitalised by turning ones into twos. Terrett led the Cliftonville Academy attack as he has claimed three for 35. There were two wickets apiece for Waqas Muhammad and David Menaul and one for Brian Anderson. Cliftonville Academy started steadily, reaching 49 for no loss at the end of the 10th over, before Neil Cahill (19) and Matthew Palmer (26) fell in quick succession to leave them 63 for two. The Templepatrick bowling attack then applied pressure as they brought on their spinners. Cliftonville Academy fell behind the rate and were 86 for three at the drinks break. Menaul top-scored with 46 – hitting five fours – as Cliftonville Academy fell short of victory in front of a healthy crowd. He shared a 30 partnership with Andrew Magee before the latter was bowled by Kernaghan for 13. Terrett had the next highest score with 29 as he hung around to try and see his side over the line. He then found Bryans in the deep off the bowling of Jordan Carlisle. No other players made scores in double figures. 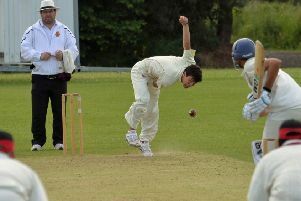 Bryans was the best of the Templepatrick bowlers as he took three for 39 off his 10 overs. The two sides are both unbeaten at the top of Section Two and meet for the top of the table clash on 19th August.